When veteran cyclist Juanita Venter blazed to victory in the individual time-trial at the UCI Amateur Road World Championships in Slovenia last year, she did so the old-fashioned way. That is to say, she scooped the world champion’s rainbow jersey in the 35 to 39 age category without the help of a heart-rate monitor or power meter. “Unlike the rest of the cycling community, I have an old-school approach when it comes to the time-trial,” she admits. But it appears that going purely on feel, or by the more fancily titled “perceived rate of exertion”, has paid dividends for Venter. 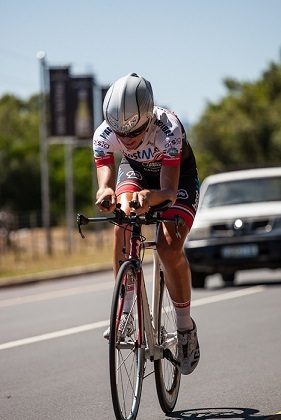 Last year, the veteran notched up the national in her specialist event and won the time-trials at the Bestmed Tour de Boland and Lowveld Tour. “I know my body quite well and on the day I give it everything I have,” she says. As a seasoned pro cyclist and spinning instructor, the experienced Venter has listening to her body down to a fine art, if not science. At the world champs, for example, she battled a strong headwind on the outward-bound part of the course. Venter struggled to keep her speed above 40km per hour and was lagging nine seconds behind at the turnaround point. On the return leg, with the wind at her back, she pushed her speeds up to an average of 45km per hour and sprinted towards the end to take gold on the flattish 18.6km out-and-back course in 26:53.2. “I firmly believe in using data to improve performance,” she says – just after the fact, not during the race itself. With an international champion’s medal as the dangling carrot, the 38-year-old says the urge to ignore the data would have been too strong anyway. “If I saw my heart rate bordering red line, would I slow down? I don’t think so. Venter registered victory on the streets of Ljubljana by just point seven of a second. Called the Race of Truth, a time-trial sees competitors riding as fast as they can over a set distance without the safety net of the bunch. But just how fast is “as fast as they can” and how do time-triallists determine their limits? For super-fit riders at the sharp end of the race, their heart rate may play catch-up to their efforts and second fiddle to their judgement. But, for the majority of social riders, a heart-rate monitor can be a handy training and racing tool. For instance, inexperience often leads competitors to overdo their effort and go out too hard at the start of a time-trial – any early time gains could be nullified by muscle fatigue later on. A heart rate monitor could provide better pacing feedback than a power meter or simply trying to gauge by feel. Every person’s heart rate is unique to him or her and finding the sustainable threshold for riding a time-trial at your limit is key. While the maximum heart rate zone was previously the yardstick here, the concept of the lactate threshold has recently gained popularity. The latter is about finding that unique danger point at which your muscles produce lactate (lactic acid) faster than the body is able to neutralise it. In other words, it is about discovering the highest intensity and fastest pace at which you can continue to ride without feeling too much of the burn that will eventually cause you to slow down. A sudden increase in the heart rate is usually a good indicator of lactate accumulation, as this is the threshold at which aerobic energy production becomes anaerobic. A heart rate monitor can help to guide intensity and pacing, and while you may not snag the rainbow jersey like Venter, you could turn in a “winning” time-trial performance of your own.